Armed with a snowboard and an attitude that just doesn’t seem to jell with limits, Terje Haakonsen has shattered the world’s idea of what was thought possible. He has also bagged some of the first descents in the mountain wilderness of Alaska, dropping down massively steep chutes. Terje is one of the living legends honored with our Signature Series Goggles. Terje is a warrior of the woods, and the strap and chassis of the goggle carry Nordic inspired artwork to reflect that. Match it with your choice of performance lens. Introducing Oakley Airbrake™, a performance snow goggle with an interchangeable lens design that helps you adapt to the environment and enjoy the best vision possible. Oakley Switchlock™ Technology makes lens changing fast and easy, and two lens colors are included with each goggle so you’ll be ready for a range of conditions right from the get-go. Additional lens options are available, so no matter what the mountain has in mind, you&r;ll be able to keep up with changing light conditions and maximize both performance and safety. A mountain can throw down more weather conditions than any other environment. From sunlight glaring off glacial ice to socked-in blizzards and mud-thick fog, the variance is extreme, and no single lens tint can provide optimal performance for every environment. The Oakley Airbrake snow goggle has an interchangeable lens design that lets you adapt to any light condition and match your vision to the environment, and it utilizes Switchlock Technology to make lens changing quick and easy. Interchangeable lens designs are nothing new for goggles but conventional technology puts you at a disadvantage. Impact protection can be compromised. Uneven pressure can distort the lens shape, altering the optical properties and corrupting your vision. Changing the lens can be a real pain. Oakley solved all these problems with Switchlock Technology. Switchlock Technology offers the most elegant and simple solution, and it does so while maximizing impact protection, eliminating visual distortion and giving you a fast and easy way to swap out the lens. Just rotate the lever of the locking mechanism. The mounted lens is released and the goggle is ready for whatever alternate lens you need. Your vision will be razor sharp and accurate, and you’ll have protection that meets the gold standard: ANSI Z87.1 rated impact resistance. Airbrake is optimized to fit medium to large faces, and the architecture offers all-day comfort. We crafted the durable yet lightweight frame with a rigid front and a flexible chassis, so the front eliminates pressure in the nasal area and maximizes airflow while the O Matter® chassis adapts for a perfect fit. Strap outriggers ensure pressure is distributed evenly, and we engineered them to work with or without a helmet. Along the facial contact area, this goggle has a triple layer of polar fleece foam that balances pressure and wicks away moisture. Our pure Plutonite® lens material filters out 100% of all UV. To fight fog, we matched F3 anti-fog technology with a dual lens design: one lens on top of another with a thermal barrier between them. 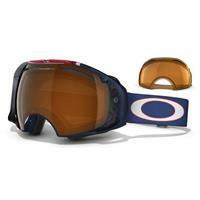 Two lens colors are included with the goggle so you’ll be ready for a full spectrum of conditions. We created a full array of optional lenses so you can arm yourself with innovation and be ready for whatever the hill throws down.